Are you ready for another fabulous release from Doodle Pantry? Well, it's June 1st and that means Laurie has even more terrific digital stamp sets for us. I used the absolutely sweetest baby set called Baby Shoes. This is a picture of all the wonderful images and sentiments you receive when you purchase this set. I used the baby blue colorized version of these Baby Shoes. Laurie also made them in pink and a neutral color, as well as giving you just the outline so you can color them yourself. The designer paper I used came from the set, as well as the sentiment. I used Spellbinder's Marvelous Squares and printed an extra copy of the shoes and cut them out by hand. I layered them on top of the other image to add dimension to the card. I purchased these cute little charms from Joann's and I punched little holes and added them to the bottom of the image. I used white and navy card stock for layering. A new digital challenge will also begin at noon today and run until June 24th over at the Doodle Pantry blog. The rules are simple...just use a Doodle Pantry image, not just a sentiment, and enter your card using the inlinkz button. There are lots of images on Doodle Pantry's Freebie page. 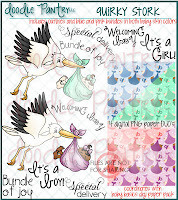 Just for entering the challenge, you will receive the Quirky Stork set free. Here is a picture of that set. Always look on Doodle Pantry's Specials page before checking out. 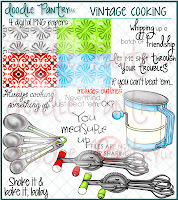 This month, the free with purchase set is Vintage Cooking. But you need to hurry, it is only free with purchase until June 24th. Here's a peak at that wonderful set too. I think you will agree with me, this is one fantastic release. I hope you all enjoy this fun new release as much as I do! Please stop by my fellow design team members pages and see what they have created. You will find the links to their blogs on the right-hand side of my blog. I absolutely adore this darling baby card. Beautiful and classy mix of elements. Gorgeous work, Susan. Susan, this is gorgeous!!! I love the die cut frame and paper piercing! The extra shoes really shows them off!! Those tiny charms are adorable!!! How absolutely precious! Love those shoes! And your charms are simply perfect. Hi stranger! Have missed you lately! OMGoodness these are the cutest shoes for those tiny feet! Love your coloring also~ very cute!! 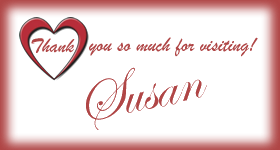 Gorgeous card Susan! Love those added charms....clever! Marvelous card, Susan! Love the design with the fancy corners on the image die cut. Lovely paper and those charms are incredible! Adorable card! I am so glad you did a boy since I did the girl shoes! LOL! Love the little charm embellishments! That die cut makes an awesome frame for the shoes! This card is so precious Susan. The die cut and charms are the perfect touch. So adorable those little shoes and I love the charms that you added! So cute - love the baby shoes - and love the bitty charms - makes it so special. I just love those baby shoes and your charms are so perfect for the card! Fabulous card Susan and omg...love that spellbind die...I want it, I need it, I have to have it! Where did you find those adorable charms? I've been looking in the wrong place obviously. Beautiful card,love the die cut frame and the dimensional baby boots. A very wonderful and classic looking card, wow! SO pretty how you framed these adorable shoes. Lovely dimension too.